Ludington's Pumped Storage Plant is an engineering marvel, and one of the world's largest electric "batteries." The 27 billion gallon reservoir, which measures 2.5 miles long and one mile wide, can generate up to 1,872 megawatts of electricity. That's enough power to serve a community of 1.4 million residential customers. The plant was named one of Michigan's Top 10 civil engineering projects for the 20th century. Ludington Pumped Storage Plant Celebrated 40th Anniversary in 2013 In February of 2011, Consumers Energy and Detroit Edison announced an $800 million upgrade to the Pumped Storage Plant. This project began in 2013, upgrading the generating capacity from 1,872 megawatts to 2,172 megawatts and replacing its six turbines with more efficient models. The six-year project will increase the plant's generating capacity by 15%. The Lake Winds Energy Park constructed in Summit and Riverton townships just east of the plant will also increase the pumped storage capacity. Called the "Project" by locals, the plant can be reached by driving south on Lakeshore Drive, off Old US-31. 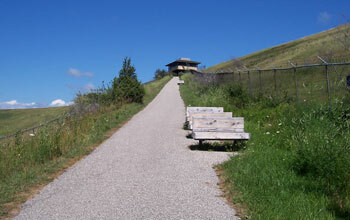 Visitors can climb to the observation deck, which overlooks the plant's 842-acre reservoir. The view is incredible from the top, with Stearns Beach and the Ludington North Breakwater Light clearly visible in the distance. The observation deck is open Memorial Day-Labor Day. 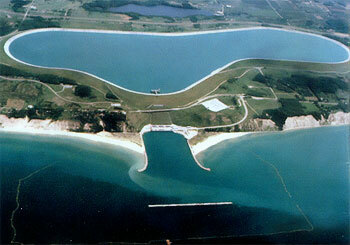 The Ludington Pumped Storage Plant was built from 1969-1973, employs 36 area residents, and is co-owned by Consumers Energy and Detroit Edison. At night when the demand for electricity is low, the reversible turbines pump water uphill from Lake Michigan through six large pipes to the reservoir. During the day when demand for electricity is higher, water flows back down through the penstocks, turning turbines that produce power. This simple technology enables the plant to respond quickly to the highs and lows of Michigan's energy demand. In respect for the environment and Lake Michigan, the Ludington Pumped Storage Plant has taken great care to protect fish. 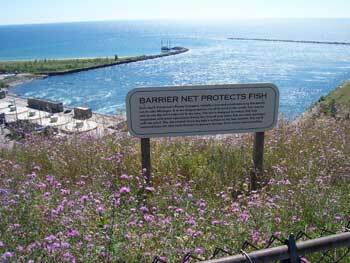 Every spring, workers install a 2 1/2 mile long barrier net to keep perch, salmon, and trout away from the plant. It is removed in the fall, as the severe winters would damage it. Deer roam freely on the hilly grounds, and a variety of birds make their home in boxes found around the plant.